There are spoilers for The Force Awakens in this post. The rock (for it is more rock than island) stands about 11 km out to sea, rising out of the mist to tower over its little brother, whose gannet-lined cliffs sit 1.5 km away, only marginally closer to the County Kerry coast. “Skellig Michael03(js)” by Jerzy Strzelecki – Own work. Licensed under CC BY-SA 3.0 via Wikimedia Commons. This rock is only 0.219 sq km large. That’s about 0.085 sq miles, or 54 acres, of jagged rock (and whatever mossy plants can manage to grow on it), ending in steep cliffs straight down into the Atlantic. The seabirds don’t seem to mind the harsh conditions. Kittiwakes nest directly on tiny cliff ledges, and puffins flap their tiny wings to take off and land in defiance of the strong winds. But what could posses a human being to come here? To make the rough journey over 11 km of open ocean, only to find no beach or dock, just inhospitable cliff walls? Christian monks arrived from Ireland in the 8th century, or slightly before. They sought out the austerity of the rock, wanting to live and pray in isolation from the world. They stayed for several centuries, fending off Viking attacks and building domed structures that still cluster on the rocks like wasp nests long abandoned. Others came. Were they Jedi hermits? Rebels looking for a hideout even more remote than Hoth? An Irish navy ship monitored the rock during filming in the summer of 2014, maintaining the secrecy of the Episode VII scenes shot there. 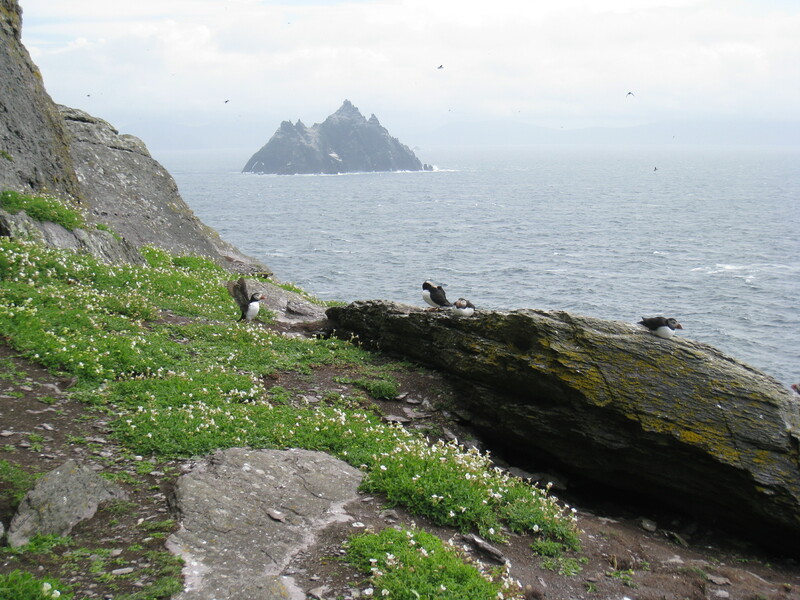 I came to Skellig Michael on July 3, 2015. My journey was part ecotourism, part pop-culture pilgrimage, and part self-actualization. And in many ways, it was the most memorable part of my trip to Ireland. The tour was 8 days long, starting in Dublin on Sunday and going counterclockwise (or “anti-clockwise” as they say) around Ireland. Skellig Michael was planned for Friday, assuming the weather was good. It always comes down to the weather: too much wind and waves means there’s no way to safely disembark on the island. Through the whole week as we visited ruined castles and hiked up mountains, I could feel momentum building. I had chosen this tour partly because of the opportunity to visit this place where a Star Wars movie had been filmed. My nerves were building, too. We were warned that the boat ride out to Skellig Michael would be rough. And once on the island, there are over 600 steps to reach the monks’ settlement at the top. That’s 600+ winding, uneven steps that the monks hand-built centuries ago, with no hand rails, that get slippery as ice when it rains. And there are no bathrooms. For like, 6 hours. Thursday night I was so nervous I already felt sick to my stomach. Though I had spent about a week on a boat when I toured the Galápagos, that was 8 years ago and the most recent time I’d done something requiring warnings about motion sickness (the “Forbidden Journey” ride in Hogwarts at Harry Potter World), it made me quite sick. I brought Dramamine with me, but I’d never used it before and didn’t know how well it would work. In the morning it looked very windy. We ate breakfast as our guide went to confirm that we were still on for the outing. I ate about 3 bites of toast and drank half a cup of tea. I didn’t talk much either. I prayed for cancellation, then scolded myself. I emailed my husband, though I knew with the time difference he would not be awake, let alone responding. I admit: I nearly backed out. Pretty much the only thing that got me on the boat was the knowledge that I wouldn’t be able to live with myself if I didn’t at least try. It was time to face my fears. On board they gave us rain coats and pants to put on. They didn’t help. The boat pilot, who had done this journey hundreds if not thousands of times over several decades, warned us it would be “bumpy” on the way out. Bumpy. Ha. The sea spray splashing over the side got all of us wet. My trail pants were soaked through. My shoes were designed to be waterproof…from the outside. The sea water dripped down into my socks and insoles until my feet were in small puddles. My body was pumping adrenaline now as I clutched my seat and braced for oncoming waves. 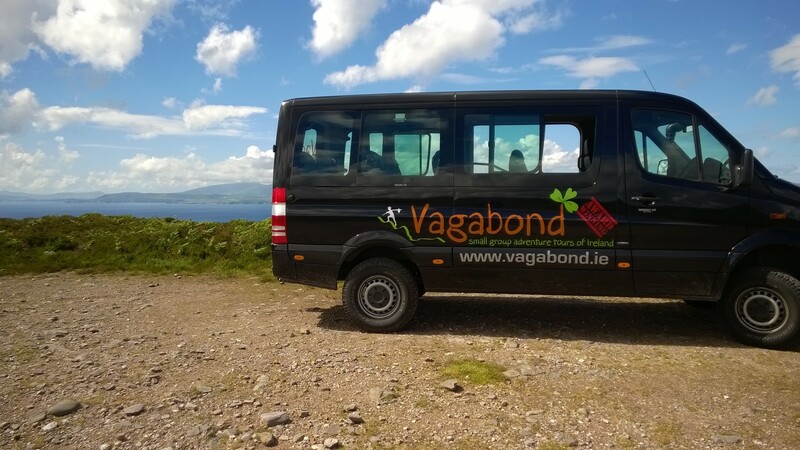 I told myself I didn’t care if I arrived on Skellig Michael soaked or retching. The point was to be there. Two people on board got sick on the way out. But I wasn’t one of them. The Dramamine worked well enough, and I distracted myself with first sightings of various sea birds. It was impossible to look for the Skelligs ahead of us without getting a face full of sea water. The ride must have lasted at least an hour. We all felt the length. We passed Little Skellig with its rows of white gannets, and finally pulled up next to the concrete staircase that serves as a makeshift dock for the big island. My shoes squished as I took my first steps on Skellig Michael. I was here. It was real. 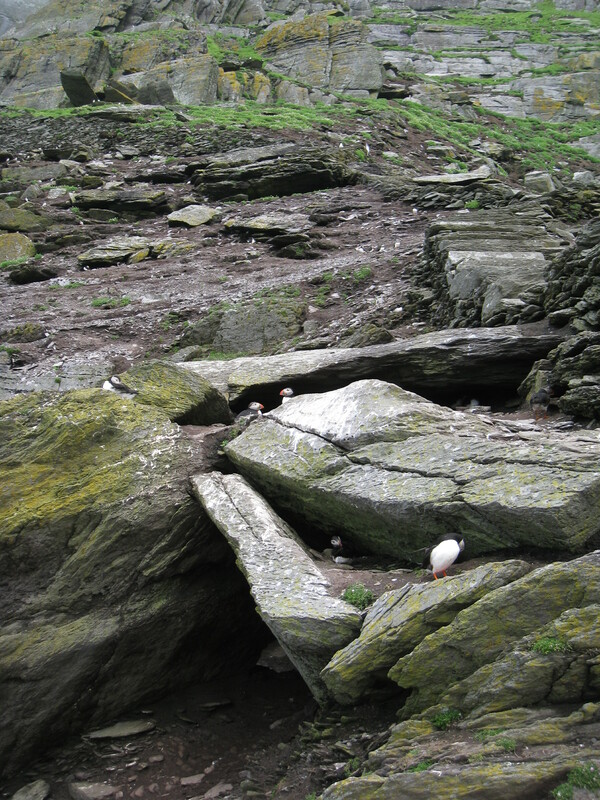 I dawdled as I walked the path to the monks’ stairs, watching the puffins fluttering. Someone pointed out kittwake nests with chicks in them, situated on cliff ledges with just barely enough room for parent and young. I took a selfie with the island’s rocks in the background as proof I’d been there. I took pictures of puffins about every 10 feet; I defy you to find a cuter seabird than a puffin. Those of us who felt well enough to climb the stairs grouped at the bottom for a safety talk, which is no joke. 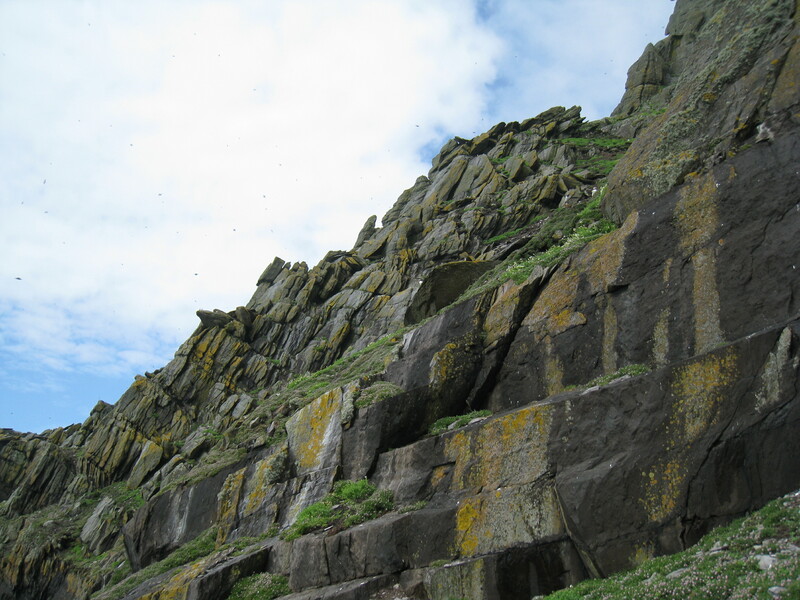 Visitors have been injured and even died on Skellig Michael. I started up the stairs slowly, and soon the rest of the group had left me behind. We had about 2 hours on the island, and my plan was to go up as high as I could in an hour, then start back down again. I would go up maybe a dozen or twenty steps at a time, then just sit on a step for awhile. The sun was shining gently and the wind was working to dry my pants. I sang some 2NE1 out loud to the puffins, speculating that it was the first time they’d ever heard K-pop. 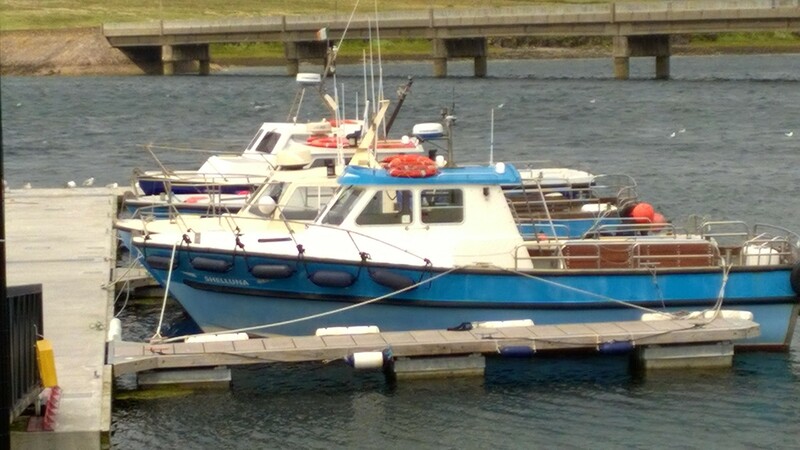 There were very few other visitors that day; we learned later that only 2 of the other larger boats had gone out–the smaller boats remained at the dock in Portmagee. I was often the only person in sight. I took more pictures of the puffins, and it was at this point that my camera died because I am an incompetent traveler and hadn’t been able to find my battery charger before leaving the US. It was nesting season for the seabirds. Puffins are small birds and they nest in burrows and crevices under rocks. Many of them were pulling up little bits of the sea campion growing near the steps to take back to their nests. You could see the females peeking out from their burrows. Every now and then I heard a sound like a lawnmower starting; it took a couple couple times before I realized it was the puffins (hear the sound here). It was a bit like being in the Galápagos in that the birds were not afraid and mostly just ignored us. They would move from the steps when I passed but had no problems flying right around us. I watched a kittiwake make a slow, hovering landing near me in the face of a stiff breeze. I didn’t make it to the top. I didn’t much mind. We had already seen several good examples of monks’ beehive huts elsewhere on the mainland. I made it up to the plateau called Christ’s Saddle between the island’s two peaks; the steps continue up the north-east peak to the monks’ cells and monastery, while the south-west peak is home to the Hermitage, which is even less accessible (you basically need climbing gear). The wind got very, very strong as I entered the Saddle and I decided to head back down. I descended just as slowly as I came up, stopping to eat a few bites, drink some water, and pop another Dramamine for the trip back. The return ride was not as rough. We paused at Little Skellig to see a dozen harbour seals on the rocks. Some of the braver members of the group whipped out their cameras. The gannets were beautiful; they are related to the boobies of the Galápagos, so I have now seen species from the family Sulidae on two continents. I arrived back on the Irish mainland once again slightly wet, but exhilarated. I had followed in the monks’ footsteps, added several new bird species to my life list, and made a personal connection with Star Wars Episode VII by visiting one of the filming locations. 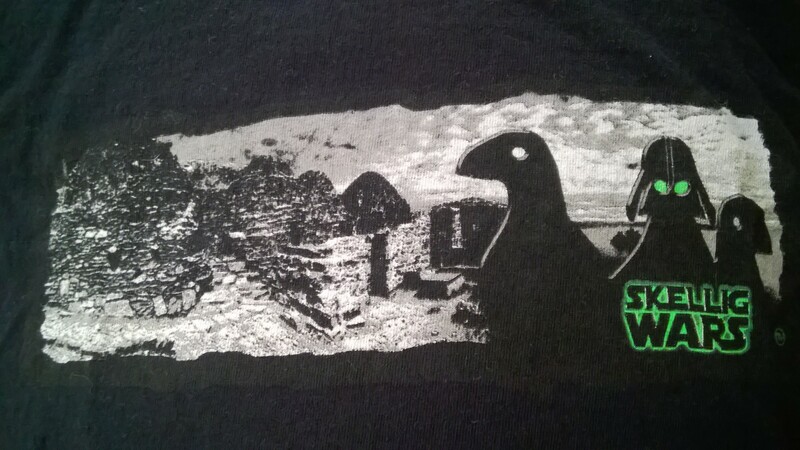 My mom went to the Skellig Visitors’ Center and bought me a “Skellig Wars” shirt. One of the employees there mentioned that crews would be back in fall to do more filming; he seemed to think it would be for Episode VIII this time. 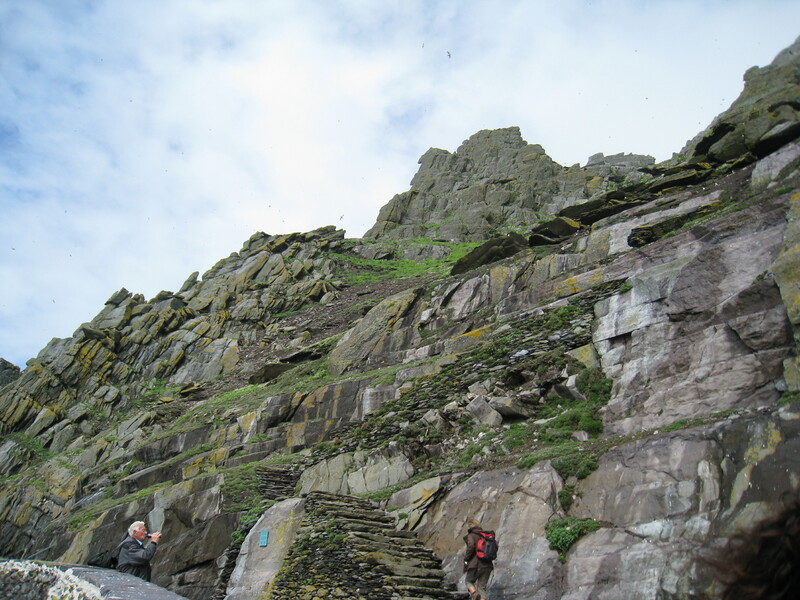 Skellig Michael’s appearance may amount to only a few seconds of screen time, but the fact that they are doing more filming there makes me think it is an important location. Anyone want to speculate on what it might be?? In short, visiting Skellig Michael was an unforgettable experience, and I’m sure I’ll be talking about it for a long, long time. 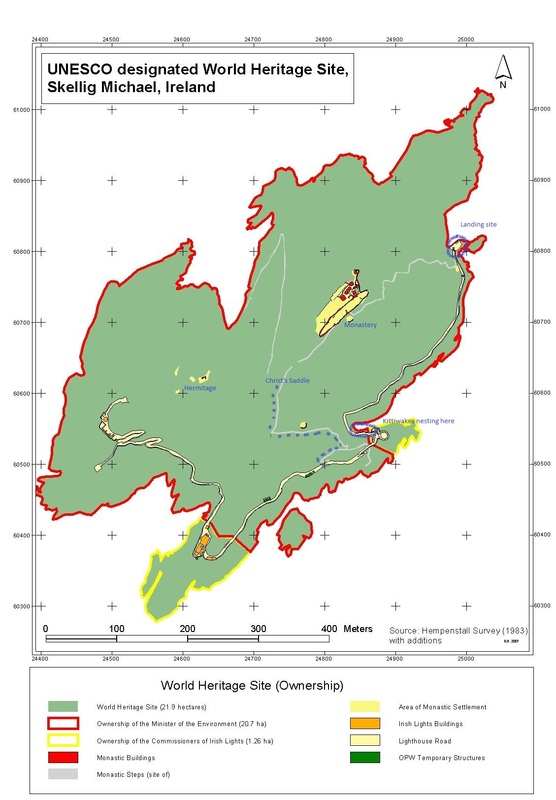 If you want more info about the island, this government brochure is a great read. The Internet has come as close to agreement as it probably ever will over one point: it’s 2015 and we’re ready for more diversity in our fiction. No more will we accept straight white males as the default character lens through which to view our movies, comics, video games, and novels. What no one can agree on now is how to accomplish this. Don’t let my click-bait title fool you; I don’t have any answers. How to best reflect our culture’s many facets is an issue that itself is multifaceted. For example, as comic books are being turned into movies, studios must walk a line between staying “true” to the source material and giving modern audiences the diversity they want. The only superheroes that have achieved any kind of permanence in mainstream popular culture include a couple of white guys (Batman, Captain America, etc.) and one white woman (Wonder Woman). So comic books, and the movies based on them, have started adding diversity to their line-ups in two basic ways. 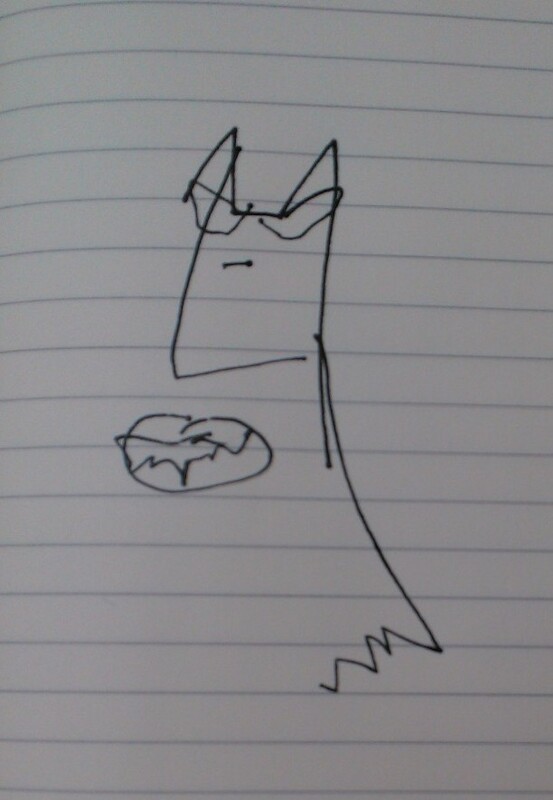 This is a drawing of Batman I did with my eyes closed…clearly the Batman:TAS version. Straight-up changing an established character’s racial/gender/sexual identity is sometimes called “bending,” as in, here are pictures of gender-bent Disney princesses. For comic book properties, race bending is most common. Both Johnny Storm (the Human Torch) and Nick Fury were originally drawn as white men, but their most recent movie incarnations are both black. The new DC Justice League movies have cast an Israeli woman as Wonder Woman and a man of native Hawaiian descent as Aquaman, both of whom generally appear very “Northern European” white in most of their iterations. Why can’t we do this for all the famous superheroes? Sometimes, certain (some would say all) aspects of a superhero’s identity are essential to his or her character. Changing Wonder Woman to a man, for example, would negate the entire idea of her coming from the island of Themyscira, home of the Amazons where men are not allowed. But portraying her as more Mediterranean in complexion makes sense with that traditional, Greek myth-related backstory. As another example, Captain America’s Aryan features made an interesting statement at the time he was created, considering that he was fighting Nazis in WWII. But is this statement still culturally relevant? American society has changed in many ways since WWII. When Batman was created in 1939, it would have been quite rare for an “old money” family like the Waynes to be anything but white. But nowadays, the idea of upper-class minorities is not so crazy, and I don’t think an African- or Asian-American Batman would be either. For Bruce Wayne, I feel his social/economic class is the defining characteristic, more than his race. Another issue is whether these kind of changes would be too confusing for a large audience. People who read superhero comic books generally get pretty good at not getting too hung up on continuity. So Nick Fury was white in the last series, and now he’s black. Ok. It’s the same way that Rogue can sometimes fly, and Jubilee is now a vampire. But for the general public, it might be confusing as to why Bobby “Iceman” Drake was into Rogue and Kitty for 4 movies but now likes boys. So, if we can’t mess with cultural icons, whether because we like their stories as-is or because they’re super profitable, then we’ll just have to make some new superhero characters that are not straight white males. Comic books have been doing this for decades. Some of these characters are now being brought into the cinematic universes, such as Falcon, who was the first African-American superhero in mainstream comics when he was created in 1969. We’ve also seen Warpath, Blink, Bishop, and Sunspot, with varying ethnic backgrounds, appear in X-men: Days of Future Past, and Skye/Daisy, who is arguably the main character of Agents of SHIELD, is a mixed-race woman. Cyborg, another African-American, will be included in the Justice League movies, despite never having been considered a founding member of the League prior to the New 52. Carol Danvers (formerly Ms. Marvel, now Captain Marvel) will be getting her own movie in a few years, the first of the MCU to feature a solo female superhero. Though she’s been around under various aliases since the late 70s, Carol has really been leading the way for female superheros recently with a new (fully-clothed) look and very popular comic series as Captain Marvel. We can see why Kamala Khan, the new Ms. Marvel, looks up to her. But the truth is, no matter how many Captain Marvel movies they make, I don’t really believe that Captain Marvel will ever be as popular or well-known as Superman. I guess time will tell. The strategy that DC and Marvel have both been using quite successfully lately combines these first two ideas: having a new character take up the mantle of a famous superhero. (It doesn’t seem too crazy considering the frequency with which comic book heroes get killed off.) Marvel’s new Avengers line-up includes Sam Wilson (Falcon) as Captain America, Jane Foster as Thor, Kamala Khan as Ms. Marvel, and Miles Morales as Spider-man. Kamala and Miles specifically have been a huge hit, being brand new characters featured in well-received solo series titles who are now being incorporated into Marvel’s headliner team. Although Ms. Marvel is not a particularly well-known superhero persona in the general public, Kamala has received huge amounts of press for being a Pakistani-American Muslim girl who deals with typical teenage problems (like strict parents) as well as dealing with criminals and saving citizens of Jersey City. Her solo series has been selling very well. Having just read the first collected volume of Ms. Marvel, I liked the way Kamala’s religion was represented: it is an essential part of her life (she would be a slightly different person if she hadn’t been raised Muslim), but at the same time it is only one part of her character, and neither the plot nor her superpowers revolve around it. Miles has even more visibility, as Spider-man is one of Marvel’s signature heroes and was ranked 3rd behind Batman and Superman on IGN’s Top 100 Comic Book Heros of All Time. 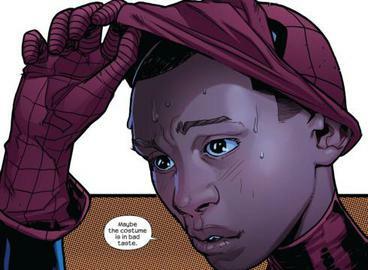 In fact, many fans have suggested that Miles be the Spider-man of the MCU (because, do we really need a 3rd teenage Peter Parker rendition? ), but the actors rumored to be in contention for the role look decidedly like young Peter Parker, so the powers-that-be at least feel that the general public is not ready for Miles as Spider-man. In the DC universe, the Green Lantern Corps is a perfect opportunity to introduce various characters and still call them “Green Lantern,” including an African-American (John Stewart), a gay man (Alan Scott), and several women. I was very happy with the choice to use John Stewart as the Green Lantern of the DCAU Justice League cartoon (despite the fact that Kyle Rayner had already been introduced to the DCAU in Superman:TAS). Why they made the (terrible) Green Lantern feature film about Hal Jordan instead, I’ll never know, but I still hold out hope for John Stewart to be the Green Lantern of the new Justice League movies. In conclusion, it’s clear that the only “right” way to increase diversity in comic book fiction is in a way that tells an interesting story with compelling characters. Character traits shouldn’t be simply boxes checked on a list; they should be used to tell a story that reflects the experiences of audience members. As both creators and consumers of fiction, we must think carefully about character diversity both on an individual level and as a whole. The answers are not simple, but we continue to work towards a goal of inclusiveness. From io9.com: What Comic Characters Would Benefit From Changing Their Ethnicity? From io9.com: What’s The Best Way To Diversify Superhero Comics? Well, guys, I think I’m going to call it. Here we are on Day 12 of November, almost halfway through the month, and I just cracked 1,000 words on my NaNo project. So, only 49,000 more to go. It’s just not happening. I had yesterday off work (just one more reason for me to thank our servicemen and women) and I had abstractly thought it would be a great time to catch up on my writing. What did I actually do yesterday? Went to the drug store, the grocery, paid bills, renewed my car registration, did a week’s worth of dishes, set up appointments for doctors and utilities, planned dinner, and raked leaves for two hours. All in all, a very productive day. I did all these things because I am an adult, and I have responsibilities. This is the way it should be, right? Until my writing in some way contributes to the household, I cannot prioritize it. Last Friday, I had the privilege of seeing Joshua Bell perform live with the Akron Symphony Orchestra. Needless to say, it was an incredible performance. He played the Bruch concerto, which I had never heard live before. Even someone who knew nothing about music would have understood that this performance was special, would have been moved by it. “Now that’s somebody who loves music,” said an attendee (probably one of the many darling old women in the audience) to the local paper. That’s the magic of those who are masters of their art. It’s nearly impossible to mention Joshua Bell without also mentioning his 2007 experiment in collaboration with WaPo’s Gene Weingarten, in which he played incognito in a DC metro station for 43 minutes. He earned $32.17, and of the thousand-some people that walked by him, only seven stopped to listen to him for more than a minute. Only one person recognized him; he was already extremely popular at the time, having won a Grammy and played on the Oscar-winning soundtrack to The Red Violin. All those people that walked through that metro station, during morning rush hour—it’s so easy to put myself in their shoes. They are focused on their responsibilities, what they have to do when they get to the office, their dawdling kid, their grocery list. This musician is at best a frivolity, at worst an annoyance. And yet, we are incredulous. How could they not stop and listen? How can life be worth living when it actively excludes Joshua Bell playing Bach on a Stradivarius from six feet away? I don’t know. I’m not giving up on my NaNo story. I don’t really care about word count, or “winning.” I have been working on this story for a year, and I just want to finish it, however many words or months it takes. Because writing is my art, and it makes life better. And yes, I am absolutely counting this blog post towards my NaNo word count. Only 48,500 more to go. *SPOILERS* ahead for Legend, Prodigy, and especially Champion by Marie Lu. As I’ve been reading popular YA dystopian series, I’ve noticed a common motif: plagues. The Matched, Maze Runner, and Legend series all have a plot element (generally in the 3rd book) involving some kind of terrible disease that main characters are trying to stop. This element is used for societal and ethical commentary, because these plagues were engineered and unleashed by people. However, using a disease as a plot device opens the door to biological science fiction, which is something I really enjoy…when it’s done well. Sorry, Eureka, that’s not how you pipette. Nope. Now, I really enjoyed Champion, the finale of the Legend trilogy, but its biology is utter crap. The first two books, Legend and Prodigy, don’t really go into biological details, and that’s fine. We know that Day’s brother Eden is being used as a bioweapon against the Colonies, having been infected with a virus by the Republic government. June, who as one of the Republic’s elite has had regular vaccinations against the plague viruses, also came down sick with something as she and Day were escaping to the Colonies. The science starts to take a turn for the worse in Champion. First, the Colonies threaten to halt the peace process unless the Republic provides the cure for the viral plague spreading through their territory; the Republic government assumes it’s Eden’s plague and requests to study him to develop the cure. Herein lies our first problem: who in their right mind would attack a NEIGHBORING COUNTRY with a weaponized virus without first having the cure, or at least retaining samples to study? It’s no good if you win the war, only to kill your own population when the virus makes its way back to you, which it inevitably will if it’s as extremely contagious as you designed it to be. This is merely a flaw of logic; it can be waved away by supposing that the Republic is a thoroughly incompetent government. Almost exactly ¾ of the way through Champion, we reach flaws in biology. This explanation takes at least two pages, where plenty of scientific jargon is thrown around, and none of it makes any sense. I am not even clear on whether the “tubes” are initially part of the cure particles or the cell itself. Viruses do work by attacking a cell, then commandeering its machinery to produce more copies of itself, then lysing the cell open to let the new copies of the virus spread. But treating a virus typically doesn’t mean stopping the cells themselves from lysing, but rather encouraging the immune system to attack the virus itself more effectively. 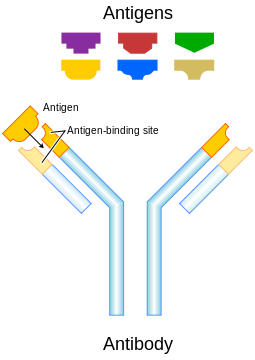 Most of what we do to treat viruses relies on the principle of antigens and antibodies in the immune system. When our body recognizes virus invaders (“antigens”), it creates specific antibodies to attach to them, which prevents them from entering cells and also helps direct other aspects of the immune system to destroy them. The idea that Eden and June’s blood could hold the key to treatment of the virus follows this principle. In the current Ebola epidemic, we have seen survivor Dr. Kent Brantly’s blood used to successfully treat one other patient, and is now being tried for two others, including the Dallas nurse who contracted the disease on American soil. His blood serum has antibodies against the virus, which when transfused into another patient will help effectively tag the virus for the patient’s immune system to destroy. So, the book’s “cure particles” seem similar to antibodies, but it has confused their target, which is the viral particles themselves, not the cells they infect. (I still have no idea what the “tubes” are meant to be.) Unless the setting is meant to be in an alternate universe (no indication of this in the books), antigens and antibodies would still work the same in future North America as they do now, and I doubt the knowledge regarding them would have been lost in ~100 years. So to take that concept further, it also makes no sense that Eden and June would have to go through all kinds of harrowing tests, including taking bone marrow (?! ), when all that’s needed is the antibodies in their blood. Viruses mutate naturally all the time; that’s why the components of flu vaccines change from year to year. (However, there’s no reason to think Ebola will mutate specifically to become airborne.) I don’t know how likely it is for two random viruses to combine together naturally. It can and does happen with similar strains of viruses, like two types of influenza; it’s called “antigenic shift” and is thought to be responsible for several flu outbreaks, including the H1N1 outbreak of 2009. But we have no way of knowing if Eden and June’s viruses are at all similar. So the scientist’s assertion that the Colonies tampered with the virus to create the new mutated strain could make sense. Except…there’s no scientific way that I know of to prove it. Splicing DNA or RNA together generally doesn’t leave any kind of fingerprint, certainly not a “marker” that could be “labeled” in a cell. Perhaps if the Colonies’ scientists added extra “foreign” DNA or RNA not found in either virus? But the Republic scientists would have had to sequence the whole viral DNA to find it, analyze what every gene does, then develop a way to tag the foreign ones. And I can’t think of a reason for the Colonies to do that anyway. Lastly, where are the original researchers that did the bioweapon research on Eden? They should be involved in making the cure, since they oversaw the development of the virus. Instead, we have random doctors at the hospital working on Eden and Tess, and a “lab tech” explaining the science to June. Perhaps all the lead researchers have been executed, or Day refused to let them around his brother to avoid trauma. But for such an important project, with the future of the country literally at stake, it seems the people with the most expertise should have been called in. All these scientific inaccuracies cannot be fully explained away by the story; the fault lies with the author. I truly wish Marie Lu had biologists critique these pages, or even better, left them out entirely, and not just because it would have slightly increased my enjoyment of the book. With the current Ebola outbreak and inane controversies over vaccination, it’s important for people, especially young adults, to be scientifically literate about virology and immunology. While the bad science probably doesn’t do any harm, Champion could have been used to educate young people about how viruses work, and how we try to fight them. A sad missed opportunity in an otherwise great book. I am not an epidemiologist/virologist/immunologist, but I do have a degree in zoology and work in medical research. If you think any of my science in this post is wrong, or if you have any better explanation of the virology as presented in the book, I would love to be corrected and learn more. Also, I’ve only read this series once and I don’t own it, so please correct me on any details from the books that may be relevant.